In this Lost Vikings Build Guide, we provide an overview of their strengths, abilities and talents. The Lost Vikings are a complex and challenging Specialist to play. I'll freely admit that I'm relatively poor with them so have to thank my good friend, Dawnstor, for working with me on this guide. Part of the complexity surrounding The Lost Vikings is the fact you control each Viking indendantly. This makes for particularly challenging gameplay as you have to not only move each Viking across two or three lanes, but also read the mini-map constantly in order to judge where you Viking's are, when you need to move them and when you need to push. Unsurprisingly, this level of map awarness and micro-management over three heroes is incredibly complex and requires a great deal of practice. With time however, The Lost Vikings can be incredibly strong on objective heavy Battlegrounds where they can constantly split push (such as Cursed Hollow or Garden of Terror). Go Go Go! (Z) – Rather than a traditional mount, The Lost Vikings are able to receive a 30% speed buff that lasts for 4 seconds. As the cooldown is 30 seconds, this will often be available when you just need that extra bit of mobility. I will stress however that it's best not to waste the skill when moving to lane and instead, use it to ensure your one of your Viking's doesn't die. Viking Hoard (Trait) – Given that each individual Viking is not particularly durable, this trait can help them withstand non-lethal damage, especially as the game goes on and you collect more health globes. Being able to regen health quickly means they can get back into the fight, which is really all any Viking wants in life. Try to ensure you grab one Regeneration Globe per lane, for each wave. Spin to Win! (Q) – This will be your main source of burst damage when in melee range of Heroes or mercenaries, and can also be used for wave clear. It will be most effective if multiple Vikings are in position to hit enemies, as activating the ability will make all 3 Vikings use it. Keep that in mind, as it will interrupt any of your channels, including Hearthstone. Norse Force! (Q) – This is a decent defensive tool, although it was nerfed considerably due to how strong it used to be. If all three Vikings are alive it will be a fairly potent shield, which can be helpful if you feel that deaths are coming too quickly. Nordic Attack Squad (W) – If you’re looking for a build focused more around basic attacks, this can fulfill that purpose. It can also be useful if the enemy team is very tanky but lacking in damage, allowing your Vikings to chunk down the large HP bars. However, the utility offered by Jump! is generally preferred. Longboat Raid! (R) – The high potential damage output (though not as insane as it was in the past), and extra survivability granted by virtue of a “second health bar,” make this Heroic have a lot of upside to it. Just keep in mind that positioning is going to be extremely important due to a lack of mobility. You especially don’t want to give your enemies the chance to destroy the boat early, as stunning all three of your Vikings for 1.5 seconds can be quite painful. Play Again! (R) – This Heroic can be incredibly useful on larger maps, if you intend on split-pushing. As long as your team has reasonable damage to put out in a team fight, Play Again! will allow you to split-push, then have all 3 Vikings join a fight, as long as one of them is alive. Again, communicating your plans with your team will be extremely important if you choose this tactic. Functioning across all three lanes (where your Vikings are), Bribe allows The Lost Vikings to gain up to 40 stacks. When a Viking also uses Bribe to clear a camp, it respawns 50% faster. For split-push and lane bully potential, it's a must-have talent. Variable: Explosive Attacks provides Baelog with 100% extra damage from his splash attack to non-heroic targets. It helps a great deal with lane clear during early soak. Mercenary Lord allows The Lost Vikings to boost their captured camps, allowing them to deal 50% more damage. In addition, it also provides Vikings with 50 armor allowing them to capture camps much easier. Variable: Erick the Swift Permanently increases Erik's movement speed by 10% and as long as he's moving, he'll heal. It's great for pushing and escaping lanes. Level 7: Spin to Win! Activate Spin to Win! to have each Viking deal 250 (60+10 per level) damage to nearby enemies. This ability does a ton of damage if all Vikings are within range of an enemy. It also clears minions well. Variable: Activate Norse Force to have each Viking gain a 500 (120 + 20 per level) to 100 (240 + 40 per level) point shield, increasing in strength for each Viking alive. This is great for surviving and stopping that pesky burst damage. Allowing The Lost Vikings to fully revive from a target location, Play Again! is a must for their death timer, but also their ability to continue to split push even when the enemy team thinks they've killed them off. Look at it as a second life. It's sad to see Jump available only at level 13 after their rework, but it's still a must for keeping your Viking's alive. A 1.5 second immunity doesn't seem long, but used properly it'll save your life. Variable: Hunka' Burning Olaf is a good alternative as it deals 75 (18+3 per level) to nearby enemies. Great for wave clearing or allowing Olaf to do more than tickle the enemy heroes. Large and in Charge - When Olaf charges enemies, stun them for 1 second. It is good if you need a stun. It can be unreliable, unless you keep Olaf out of the fight for the stun. Variable: You gain an additional 40% movement speed when activating Go! Go! Go! In addition to that, you'll also break free from all roots and snares. A must. Every 5 seconds, Viking Fury Of The Storm allows your next basic attack to deal additional damage to the target and additional damage to all nearby mercs and minions. It basically clears the minion wave and has an independent timer for each Viking. The Vikings have unique matchup threats and for the most part, they rely on the rest of their team to support them while they soak lane. I'd argue you shouldn't be fighting enemy Heroes one on one, but if you must, here are the ones you should look out for. Falstad: Dodge the Hammers! He's capable of quickly ripping through you all. Thrall: Don't let Eric or Baelog get hit by his snare. If you do, you're pretty much dead. Kerrigan: Her stun alone will almost kill Eric and Baelog. It's even worse if she's taken Ultralisk as it'll pursue you until at least one of your Vikings is dead. Nova: Snipe deals a tone of damage to Eric and Baelog to the point where unless you use Jump instantly, one of your Vikings will die. Sylvanas: Incredibly annoying to pair against as her Black Arrows keep you at a distance and prevent your lane push. Valla: Q and W = Dead Eric and Baelog. There's sometimes little you can do to stop Valla's poke. Kael'thas: Juggling multiple Vikings against Kael'thas is a headache and avoiding his large AOE even more so. Jaina: Similarly to Kael'thas, Jaina is one of their worst matchups. Cone of Cold + Blizzard can pretty much wipe you out. This list of tips and tricks are just a handful of things we think will help your Lost Vikings play. We'll continue to add to the list as required and if you have any tips you'd like to share, let us know in the comments below and we'll place them here. 1. Your goal is to reach level 10 before the enemy team and you should do this by splitting your Vikings across all three lanes. 2. Baelog and Eric don't have much health regeneration and as a result, you need to watch them closely. 3. Beware of AOE abilities as they can slaughter your Vikings in a very short space of time. Until level 20, you'll feel the cooldown. 4. Don't try to solo any Hero with only one Viking. They are very weak when alone. 5. Remember to constantly move your camera across all lanes - don't ignore your Vikings or leave them unattended for long. 6. 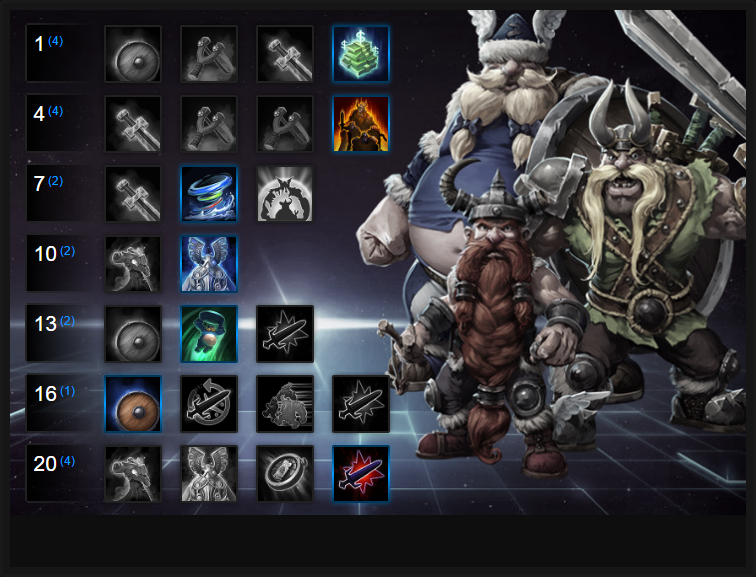 The Lost Vikings are probably the hardest Hero to learn in Heroes of the Storm and as such, you shouldn't enter Hero League until you're at least level 8 with them. 7. ALWAYS watch your mini-map. It's key to micro-managing your Vikings. 8. The Lost Vikings are all about lane soak and split-pushing. The key is to have them stretch the enemy team by forcing them to deal with you. 9. The Lost Vikings are best on Battlegrounds that have multiple, interactive objectives. This allows you to cap them and split push at the same time. 10. Remember that your Vikings only have to be in lane to soak XP. You don't have to have them constantly attack the minion wave. 11. Ideally you want to encourage your team to 4 man one lane, while your Vikings cover mid, top and bottom. This ensures maximum push and the enemy team will struggle to deal with you and the rest of your entire team pushing a lane.